Despite the Novocain, the comfy, reclining chair and the soothing music piped into the office, many people are still pretty nervous about going to the dentist. Imagine how they might have felt almost a thousand years ago, when the local barber, blacksmith or holy man might have been the one poking around in that sensitive area. Because tooth enamel is the hardest substance in the human body, teeth survive after most other human remains have disintegrated. For this reason, scientists have been able to determine that many ancient civilizations practiced some form of dentistry. Ancient writings have also revealed that, although many of these ancient civilizations had no contact with each other, most believed that toothaches were caused by a tooth worm, a belief that can be traced as far back as 5000 BC. Considering that a cavity is a hole in the tooth not unlike the hole a worm might bore into an apple, it’s not to hard to see how early civilizations came up with the tooth worm myth. However, even after humans had begun to connect bacteria and germs with other illnesses, the tooth worm legend persisted until the beginning of the 18th century. The pain from a toothache was believed to be caused by the worm wiggling around, and remedies for driving the tooth worm out of the aching tooth varied as much as the people who believed in the tooth worm. Rinse the mouth with a soup made of spiders, eggshells, and oil. Bite on a piece of wood that has been struck by lightening. Kiss a donkey. Insert into the nostril on the side opposite to the toothache a pill made from roasted garlic, horseradish, and human breast milk. Touch the aching tooth with the hand of a dead person. Well, if none of these fine remedies worked, the only alternative was to remove the tooth. Some people were lucky enough and brave enough to be able to pull their own teeth. Some might enlist the aid of a relative or neighbor. One common method of removing teeth was to simply knock them out by holding a wedge of wood against the tooth and banging on it with a hammer or mallet, but that often left the root of the tooth embedded in the gum and could lead to infection and possibly death. The best practice was to pull the tooth, but who should a person trust with such a delicate operation? As Europe emerged from the dark ages, monks were some of the most educated people, and others sought them out, looking for ways to ease their pain. Barbers often visited the monasteries to shave the monks after beards were banned by the church and to shave and cut the monks’ tonsures. (This is the practice of shaving the top of the head but leaving a ring of hair around the head.) Barbers were first simply assistants to the monks. However, church leaders soon believed that the monks were spending too much time with medicine and dentistry and neglecting their other duties. This set of circumstances led to barbers becoming the people most knowledgeable about the maladies of the mouth, and the local barbershop might offer not only a shave and a haircut, but also abscess lancing, bloodletting, enemas and tooth extractions. Barbers that focused primarily on the operations that did not involve hair became known as barber-surgeons, and they advertised their skills by placing a bucket of blood in their front window. Once the bucket of blood had congealed, it was poured into the street where it then spoiled. When people discovered the dangers associated with this unhygienic practice, barber-surgeons replaced the blood with red paint and began displaying the well-known red and white poles outside their establishments. In addition to remedies for driving out tooth worms and methods for tooth extraction, early dentistry also included tooth replacement or tooth transplants. Today people replace lost teeth primarily for cosmetic reasons. Ancient people and not so ancient people actually needed their teeth for survival. Poor dental hygiene often led to the loss of not just one or two teeth, but sometimes the majority of a person’s teeth. Without the processed food of today, it was difficult to survive without one’s teeth. Evidence of tooth replacement has been found in the remains of ancient Egyptians and Etruscans, among many other ancient civilizations. False teeth carved from bone and ivory were found secured to existing teeth with bands of gold. Sometimes animal teeth or human teeth were used to create dental bridges. After the fall of the Roman Empire, as Europeans slowly began rediscovering the knowledge that had been lost, only the wealthy were able to invest in false teeth. Poor people with good teeth were often driven to sell their teeth to feed their families. Transplants were often performed with the wealthy person ready for implant sitting right next to the poor person with his extraction-ready tooth. These were the most successful transplants. Others involved using the teeth of the dead. Battlegrounds with heavy losses were the best places for harvesting teeth. In the eighteenth century, “Waterloo teeth” were very popular. The demand for teeth was so high at times that there were even robbers that specialized in yanking teeth at gunpoint. Of course, a simple tooth transplant was not enough for some people. An entire new set of teeth was necessary. Early dentures were made of a variety of materials, such as gold, hippopotamus, elephant and walrus ivory, cattle teeth and human teeth. No matter the material, early dentures fit poorly and were often uncomfortable. Thankfully, there were enough people interested in dental maladies to give rise to the organization of dentistry in the mid 18th century. One key person in this process was Pierre Fauchard, a Frenchman who had trained as a military surgeon and dentist. He organized dentistry as an independent profession, separate from medicine, tooth-drawers, and barbers. He even went so far as to share his “secrets”, something no other practitioner had ever done before, in a book published in 1728, The Surgeon Dentist, or Treatise of the Teeth. Fauchard’s book put forth many ideas that are still relevant today: the debunking of the tooth worm myth, the importance of dental hygiene, the need for specialized education for dentists, the importance of gum care, the dangers of botched tooth extractions, the possibility of realigning teeth and improvements in the fit and appearance of dentures. From these beginnings, dentistry advanced remarkably. One of the first American-born dentists was Josiah Flagg (1763-1816) who is responsible for designing and manufacturing the first dental chair. Using an ordinary Windsor chair, Flagg added an adjustable headrest and an enlarged arm for holding dental instruments. Practicing both orthodontics and oral surgery, Flagg was ahead of his time in many ways. It is believed by some historians that he was trained by Paul Revere because Flagg’s father was Revere’s partner. In 1840, the first dental college in the world, Baltimore College of Dental Surgery, was established in the newly formed the United States of America. The first class numbered only 5, and only 2 graduated. The requirements to earn the D.D.S. degree were as rigorous as those required to earn an M.D. at that time. In 1844, Horace Wells began using nitrous oxide to perform pain-free dental surgeries, and William Morton began using ether in the mid-1840s too. The United States Congress wanted to bestow an award of $10,000 to the discoverer of anesthesia, but it was difficult to determine who the award should go to. The battle over who should receive the award ended in Wells suicide and in Morton becoming a pauper due to the extensive legal bills he amassed to prove his claim to the money. In the end, no one received the money. The use of local anesthetics given by injection began in 1858. Willoughby D. Miller discovered the damage caused to teeth after food and bacteria mixed in the mouth. He published his findings in a book, Microorganisms of the Human Mouth in 1890. Up until this time, dentists believed that decay was inevitable and that their job was to repair the damage. Miller’s discovery led to the promotion of regular brushing and flossing. Wilhelm Roentgen’s discovery and study of the X-ray eventually led to their use in dental practices. In 1901 Roentgen received the first Nobel Prize in physics. Use of X-rays in dental diagnosis was developed by C. Edmund Kells of New Orleans. Kells was a prolific inventor both in and out of the field of dentistry. He was able to demonstrate the use of X-rays in dentistry just 8 months after Roentgen published his findings. Because he was unaware of the dangers associated with X-rays, Kells spent 20 years slowly losing his arm to cancer. Thanks to the curious spirit of these pioneers in the field of dentistry and many other unmentioned men and women around the world, the profession has continued to progress. Because of the widespread promotion of dental hygiene, regular checkups and the use of fluoride, most people in America today need very little tooth-yanking. However, when the time does come to open wide and let the dentist drill, file, yank or realign, there’s reassurance for the patient that dental practices have come a long way. It will not be necessary to kiss a donkey or touch any part of a corpse to your teeth. Just lie back, listen to the soothing music and let the Novocain take you away. 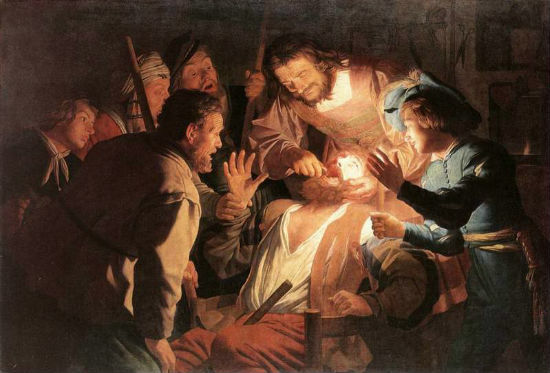 Thoroughly enjoyed reading this interesting post about the history of dentistry. I am so glad times have moved on from barber-surgeons dabbling in pulling out teeth. It is amazing to me how dentistry has moved on so much in such a brief period of time. Really appreciate the article.